The National Parfait Day is celebrated on November 25. This food-related holiday is dedicated to a delicious frozen dessert of French origin. Parfait is the French word for “perfect”. The earliest reference to this dessert dates back to the late 19th century. In France, parfait is a frozen dessert made with cream, eggs, sugar syrup, and sometimes alcohol. 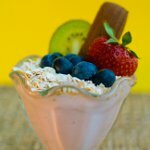 In the USA, parfait may refer either to the traditional French-style dessert or to the American parfait. American parfaits are made by layering parfait cream, ice cream, and/or flavored gelatin dessert. They may be topped with canned or fresh fruit, whipped cream, and/or liqueurs. In the Northern United States and Canada parfaits may also be made by layering yogurt, granola, fresh fruit and/or nuts. To celebrate the National Parfait Day, indulge yourself with these delicious blueberry-lime parfaits. In a small saucepan whisk 6 egg yolks, 3/4 cup sugar, and 1/2 cup fresh lime juice. Set over medium heat and stir until thickened. Remove from heat and stir in 4 tbs cold unsalted butter, 1 tbs at a time. Let curd cool completely in the fridge. Stir grated zest of 2 limes into curd. Stir together 17 ounce plain Greek yogurt and 1/3 cup confectioners' sugar. In 4 six-ounce glasses, layer yogurt, curd and blueberries, then repeat. Garnish each glass with a lime wedge.